In its pursuit of excellence and efforts to champion innovation and technology to match its fleet offering with the latest market trends, MAN Truck & Bus strives continuously to enhance not only the design element but also economic efficiency and safety features of its new line-up. 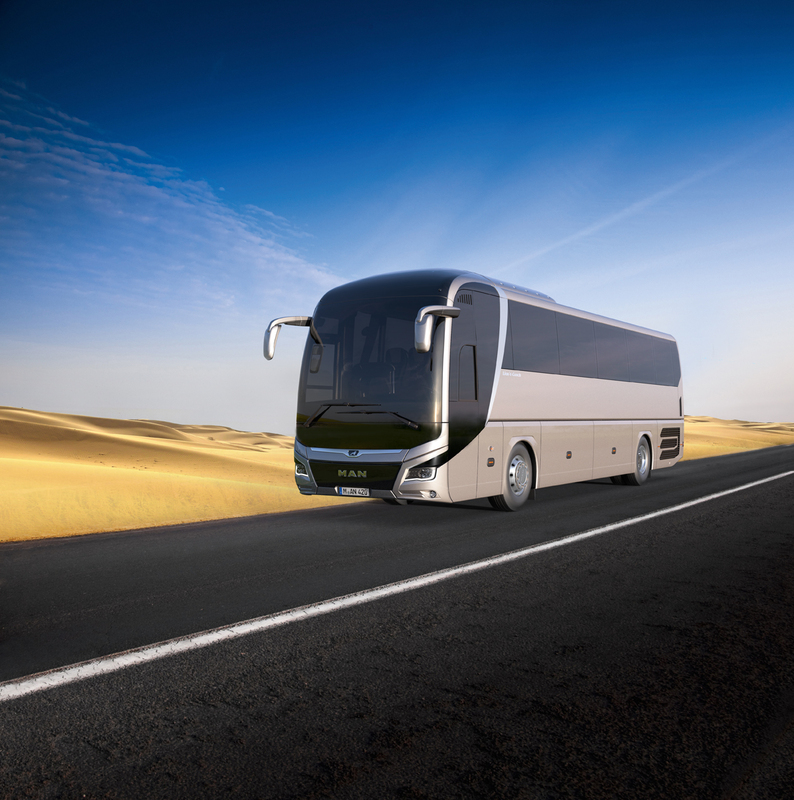 The recently launched MAN Lion’s Coach, which is already available for pre-orders in the Middle East, is a best-in-class coach and long-distance bus, and the embodiment of the company’s endeavour to offer consumers a whole new experience. The new addition to the MAN Truck & Bus Middle East’s impressive line-up of highly efficient, safe, economic and innovative commercial vehicles, the MAN Lion’s Coach is set to take over the coach market in the region with its distinct safety, comfort and performance-driven features. The MAN Lion’s Coach is available in GCC Euro engine standards to suit a complete range of fleet requirements in the region. “Inspired by the lion”, the MAN Lion’s Coach, with its modern yet timeless design, marks the beginning of the new MAN bus design language at the front, rear and sides, and sets a new benchmark in luxury, attractiveness and efficiency. The new coach’s LED main headlights and taillights reflect the leading German commercial vehicles manufacturer’s quest for technological and innovative enhancements in its fleets. The first of its kind on coaches, the LED lights make the Lion’s Coach more appealing to the eye and better in efficiency and durability. A particularly distinctive feature of the new headlight is the strip-form brand-specific daytime running light which also functions as a turn indicator. Among new safety features of the MAN Lion’s Coach includes its ability to absorb 50% more impact energy in the event of a crash. In addition, it has an array of assistance systems such as Emergency Brake Assist (EBA), Adaptive Cruise Control (ACC) and Lane Guard System (LGS) accident prevention technology. Furthermore, the new coach offers enhanced comfort and safety while travelling thanks to new generation shock absorbers and optimized vehicle configuration. In addition to providing greater driving comfort and improved handling, the new features also contribute to further increase in fuel efficiency as well as a 20% improvement in aerodynamics.